Ash gourd raita, poosanikai thayir pachadi, south Indian style accompaniment for lunch menu, especially for south Indian lunch menu. Poosanikai thayir pachadi is one of the easy recipes I learnt from my SIL here in SG. This is very very easy to prepare, yet makes an wonderful accompaniment for sambar rice or any other rice dishes. So I wanted to blog this recipe for long time. All the recipes I learnt from her are delicious but made with less effort! Try this with any stuffed parathas too,it would be nice too. Remove the seeds and centre soft part of the ash gourd and peel off the skin too. Grate it. Take grated ash gourd in a microwaveable bowl and cook for 4 minutes in high. Make sure you stir in between twice. Grind Coconut, Green chillies, cumin seeds, little Water to a smooth paste and mix it with the cooked ash gourd. After cooled down,mix in the curd. Temper with the items given under ‘To temper’ and mix well. You can skip the microwave part and have it raw.You can also sauté the grated ash gourd stove top,instead of microwaving! Take it in a microwaveable bowl and cook for 4 minutes in high. Make sure you stir in between twice. Grind the items given under ‘To grind’ table to a smooth paste and mix it with the cooked ash gourd. Temper with the items given under ‘To temper’ table and mix well. Serve as an accompaniment for rice! We had it with Poondu kuzhambu,Paruppu thogayal…blissssssssss. simple. quite perfect for the summer so that we get to spend less time next to a hot stove. Thanks Raji. wow the pachadi looks so tempting and very simple one …… lovely pictures by the way !!!!! Yum–perfect for summer.We have a Konkani version for this which is called Kuvale[ash gourd] Sassam,only difference being,the ash gourd is cooked in a saucepan and instead of Jeera,Mustard seeds[sassam in Konkani]is added to the ground masala.Its been ages since I had this–your pics look great,this would be perfect with a spicy paratha!! This summer I m trying raitha with each n every veggie,it has bcum more than essential…loved d first click..have u taken this pic in d night by any chance raks? Looks so soothing and delicious.. perfect for this summer..
Yummy and good for health in this summer. Perfect coolant for the body. Looks delicious perfect for the summer wheather. This is one of my fav veggie, buti have not had it like this dish, how i wish i got this vegg here. Looks delish. Love this pachadi, beautiful and healthy definitely.. I've not tried pachadi with pooshnikai – love that picture! wow..thats one very tempting clicks….looks very delicious..!! Wow wonderful pachadi dear..tempting clicks. Oh yeah, def..tasty, the grind items are similar to what we use for mor kulambu….I can foresee the taste .. Wonderful pachadi and lovely clicks! Lovely pictorial. I love the bowl. We make mor kuzhambu with poosani. Pachadi looks delicious and perfect for this summer. Last time my friend made a thayir pachchidi with red pumpkin…I have a picture and not drafted the recipe:( I think it is time to share that one having seen this wonderfully done pachchidi! Never tried with ashgourd….this looks perect!!yummy!! Yummy and easy pachadhi.Never tried anything with ashgourd. interesting…i make only okra pachadi…ashgourd pachadi looks yummy n creamy!nice click! We make something similar. We add a bit of coconut to it & call it hashi. Tastes great as a side dish with rasam or sambar. Beautiful clicks Raks. Really nice n fresh recipe ~ loved the coconut in there ! Lovely colour Raji! Shall try sometime this week. Havent tried this pachadi before.. will surely try it this weekend. seems like it wil taste great with curd… thanks for giving one out for the summer. my MIl makes this often …I love it and also we can have this as raita! 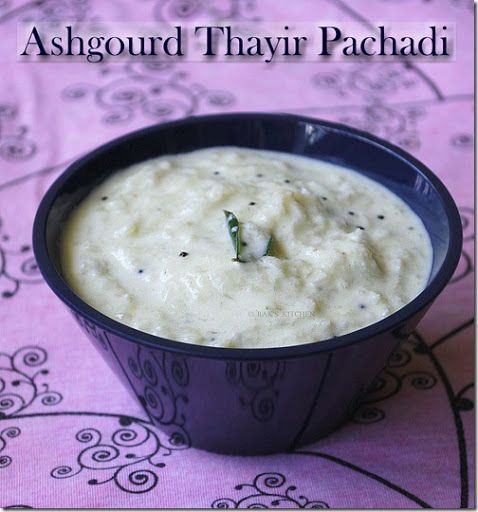 Creamy and delicious pachadi..Perfect on a sunny day..we make something similar with potatoes. Pachadi's are so simple yet delicious. That first pic is a beauty! Lovely pachadi and picture too ! This one sounds great for summer and for spicy rice.